So, I decide to get back into anime blogging a bit, and what’s the first series I pick at random? Red Data Girl, a spring series about a meek shrine maiden who’s the human host for another shrine maiden, only with nicer clothes. And she needs other people to use Google for her because computers break around her– especially when she cuts her bangs. Look, they can’t all be winners. On the plus side, this scene from episode 3 made me think of “Send him, Yuna,” and that always makes me happy. 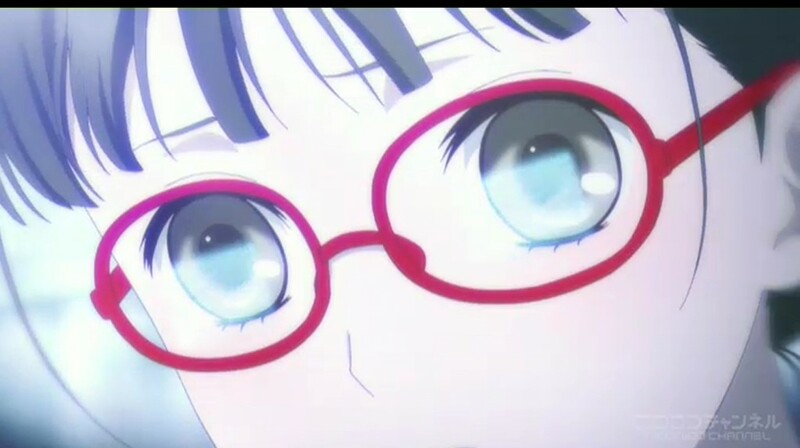 Despite my snark, Red Data Girl (or RDG as the show’s title screens seem to want us to call it) really isn’t bad; so far, it just isn’t particularly good. The character designs are generic as can be, the animation isn’t anything special, and the writing seems pretty average so far. 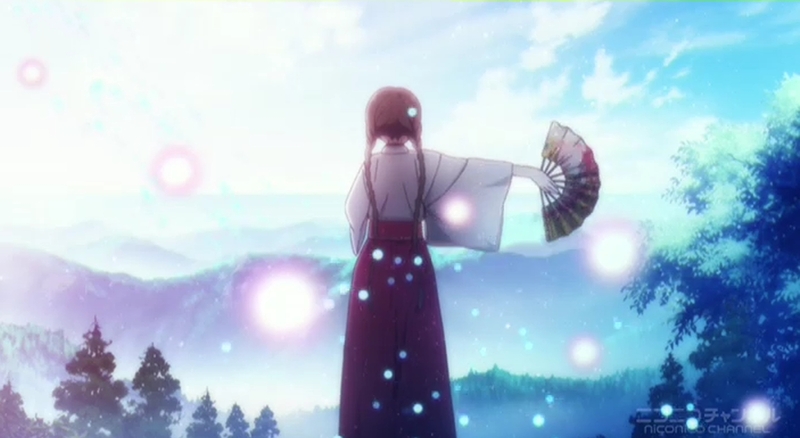 The backgrounds of main gal Izumiko’s mountain home are often very pretty, but that doesn’t count for too much. However, the story does have some potential. An unusually shy girl who’s been intensely sheltered finally learns why everyone has been treating her like some fragile piece of precious china; she’s a host body for the Himegami, some kind of goddess with vast powers that could easily be abused by the wrong person. Miyuki, a boy who used to bully her as a child, is recruited to become her protector when it’s time for her to leave her rural mountain home for the dangers of high school in Tokyo. The main issue with the story is that Izumiko is meek to the point of being irritating. I understand that she’s been sheltered by her family and tormented by strange visions, so it isn’t really her fault, but her complete inability to take charge enough to even ask important questions grates. For example, when people start saying she’s the Himegami before she knows what it means, she doesn’t even ask them to explain what the hell they’re talking about. To be fair, as early as episode 3 she’s improved, but it’s hard to relate to her since she shows so little curiosity about anything. Miyuki is slightly more interesting: I think he made the transition from “I want nothing to do with this boring girl!” to “Hey, I’ll be your bodyguard in Tokyo!” awfully quickly, but hey, seeing a God in person can do that to you. Obviously, I can’t really recommend this show, but I’ll probably check out at least another episode or two just to find out what’s up with the Himegami; the characters have been very tight-lipped so far about exactly who she is and what she can do, and I am slightly curious what her agenda is. I’ll let you know if an OMG! plot twist crops up to make this show a keeper, but I’m certainly not expecting one. 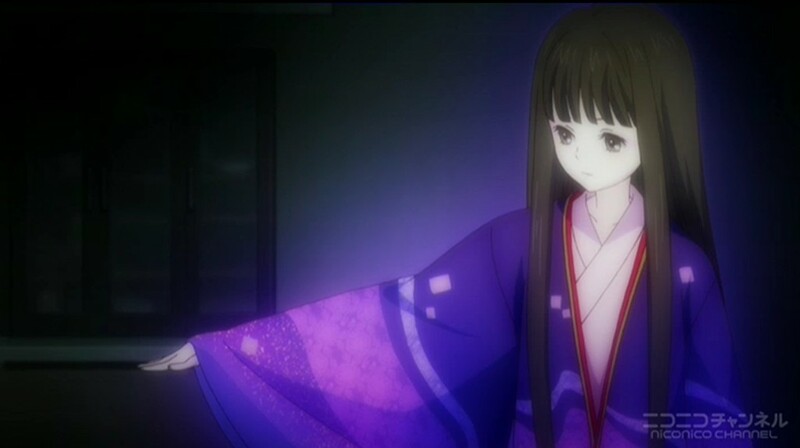 The Himegami, which, unless I’ve completely lost all my college Japanese, means something like “Princess Goddess.” The one ability we know she has so far is to magic up a pretty awesome kimono. Don’t scoff, that’s a celestial power I can get behind.